Two words “knowledge and skill” can describe a person’s competence! Both seem synonymous at first glance but given more thought, they depict different concepts. Knowledge refers to learning concepts, principles and information regarding a particular subject(s) by a person through books, media, encyclopedias, academic institutions and other sources. Skill on the other hand refers to the ability of using that information and applying it in a context. Knowledge refers to theory and skill refers to successfully applying that theory in practice and getting expected results.A Bachelor of Engineering graduate is knowledge oriented while a Bachelor of Technology graduate is skill oriented. Engineering and engineering technology are separate but closely related professional areas. They differ in curricular focus and career paths. On Curricular Focus, engineering programs often focus on theory and conceptual design, while engineering technology programs usually focus on application and implementation. Also, engineering programs typically require additional, higher-level mathematics, including multiple semesters of calculus and calculus-based theoretical science courses. Engineering technology programs typically focus on algebra, trigonometry, applied calculus, and other courses that are more practical than theoretical in nature. On career paths, graduates from engineering programs are called engineers. They often pursue entry-level work involving conceptual design or research and development. Many continue on to graduate-level work in engineering. Graduates of four-year engineering technology programs are called technologists, while graduates of two-year engineering technology programs are called technicians. These professionals are most likely to enter positions in sectors such as construction, manufacturing, product design, testing, or technical services and sales. Those who pursue further study often consider engineering, or facilities management, or business administration. Bachelor of Technology – equivalent degrees are offered in a number of accredited universities across the globe including; the United States, United Kingdom, Germany, Austria, Switzerland, Ireland, Australia, New Zealand, and Israel. What is the Bachelor of Technology Programme at TUK? TUK's Faculty of Engineering Sciences and Technology offers skills-based Bachelor of Engineering Technology, which is a one of a kind programme tailor-made for students either straight from High School or those who have already completed a Diploma in technology from a recognised institution. The High School leavers are admitted to the program in the first year while the Diploma holders are admitted directly to level 3 of the 4 year B.Tech degree. Currently, there are two steams namely Module I (Government sponsored) and Module II (Privately sponsored). The Module II stream incorporates flexible evening and weekend classes that allow students to work while they study in an existing career path. Both Module I and II programmes incorporates Industry Based Learning sessions (IBLs - Internal and External) where focus is on inculcating practical skills to problem solving. 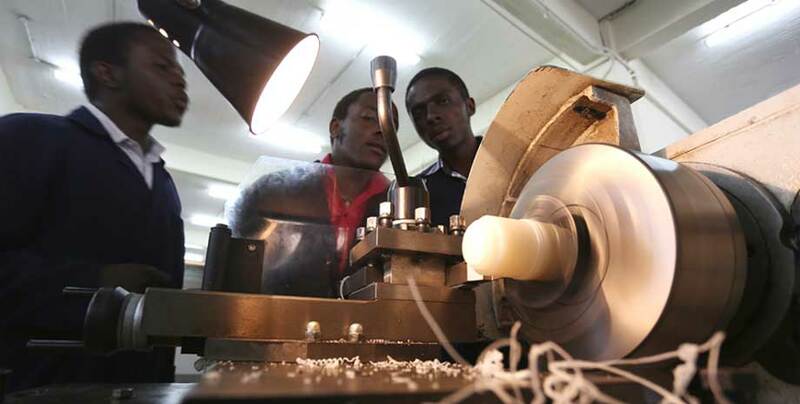 The TUK Bachelor of Technology programme is the first of its kind in KENYA. It was developed in consultation with employers to ensure that our graduates meet the needs of the engineering industry today. With a B.Tech degree, you’ll be ready to step directly into a career that lets you move between the shop floor and the executive suite. Alternatively, you can pursue additional studies including Masters and Doctorates programmes.